Join us on a weird magical mysterious journey through our perfect worlds. 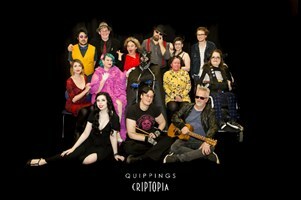 Sat 24th CRIPTOPIA 730pm-830pm AUSLAN INTERPRETED NIGHT!!!!! STARS! Clare Barnier (pic above by All About Pout); Emma J Hawkins, Rowan White, Kath Duncan, Anthony Julian, Carly Findlay, Sarah Widdup, Natalie Corrigan, Liam Fergeus, Sonia Marcon AND SPECIAL GUEST STAR SUE ANN POST. RUMOR HAS IT THE BEARBRASS ASYLUM ORCHESTRA ARE BACK!!!! Proudly supported by the City of Yarra and Writers Victoria.